I hope you guys had a good Easter weekend! 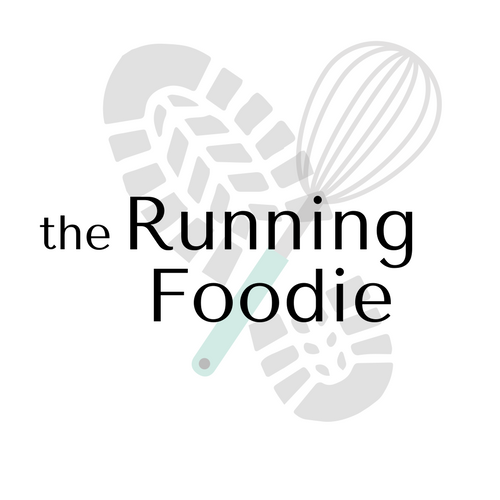 I kicked things off on Saturday by preparing Joy the Baker's Biscuit Cinnamon Rolls before my long run. The dry ingredients were prepped the night before and chilled in the fridge overnight. I also mixed the sugars and cinnamon with softened butter and left it out, covered, overnight. This cut down on prep the next morning so that all I had to do was form the dough with the wet ingredients, roll it out, spread it with the cinnamon butter, and bake the biscuits. I spread a thin glaze on the biscuits right after they came out of the oven. The biscuits are baked just long enough to brown the tops, leaving the centers soft and moist without being doughy. 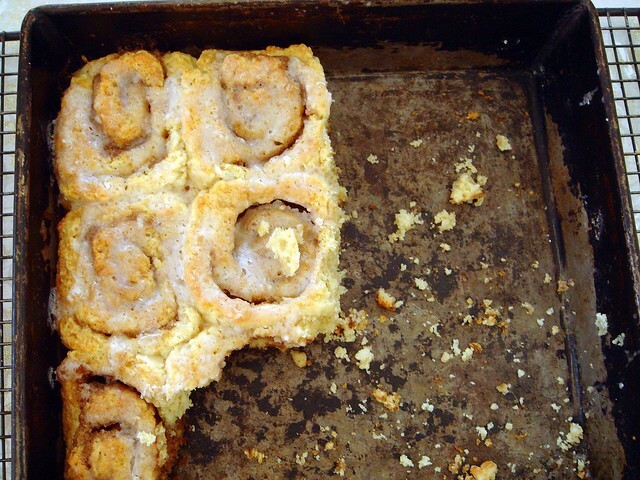 Even so, these are best compared to scones, not to cinnamon rolls. It did fix my craving, though. Next on the agenda was the strawberry pretzel dessert for Sunday. I had a hair appointment later in the day, so I wanted to finish part one and two of this dessert before I left. That meant preparing the simple pretzel crust, baking it, and letting it cool. Part two is the the cream cheese filling. 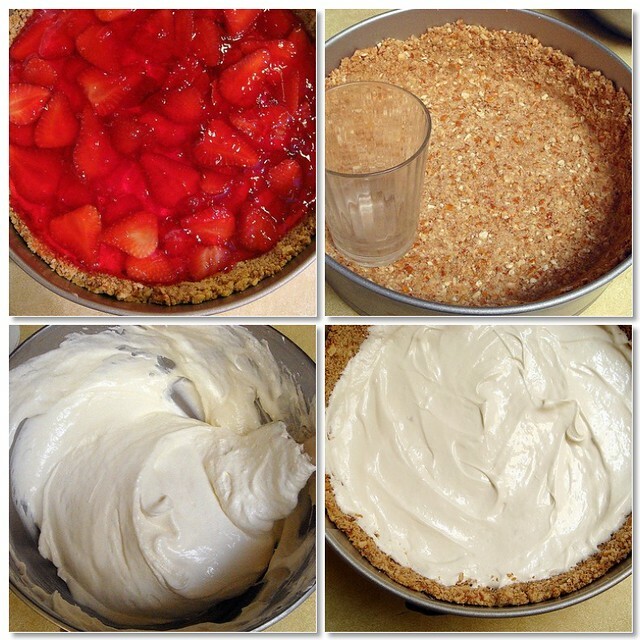 I really like this filling because the cream cheese is lightened by folding in Cool-Whip (alternatively, you could whip heavy cream, if you prefer). I poured the filling into the cooled crust and placed it in the fridge to set. Later in the day, I finished part three by making the strawberry jello layer, which involves two boxes of jello and macerated strawberries. It's pretty simple and tastes great. 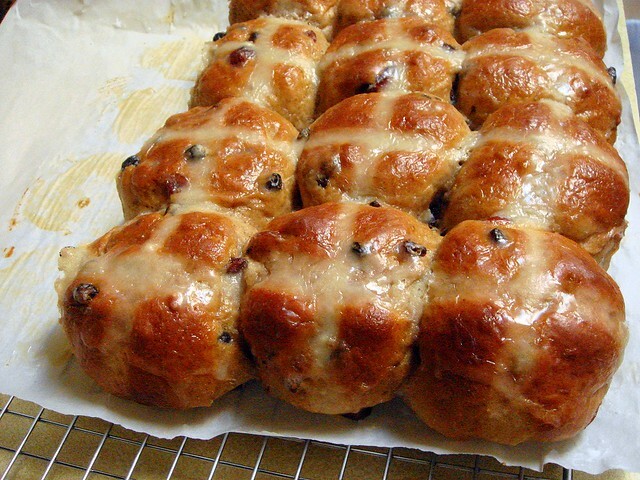 My family and I baked hot cross buns late on Saturday. We make them every year for breakfast. 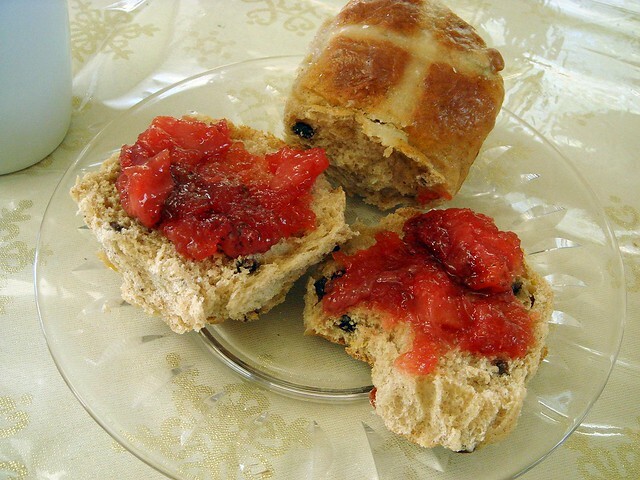 The buns are split in half, toasted, and spread with butter and homemade strawberry jam. Delicious start to the day! 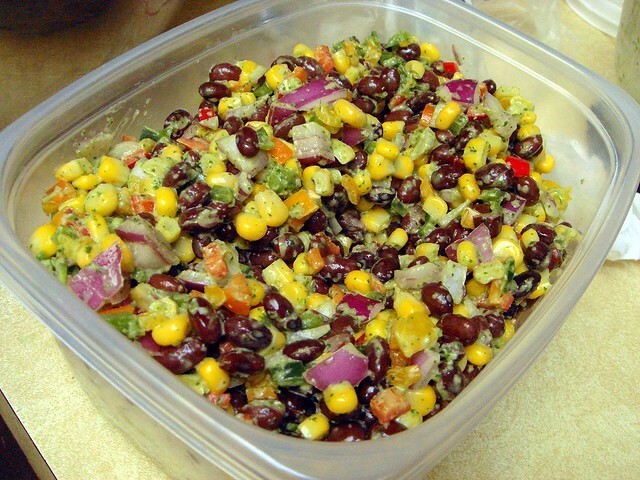 Dinner included fresh black bean and corn salad with a cilantro-jalapeno vinaigrette. 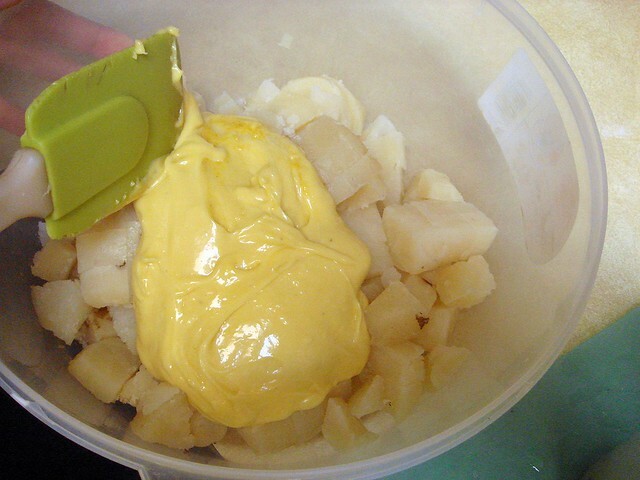 Potato salad with homemade mayonnaise. 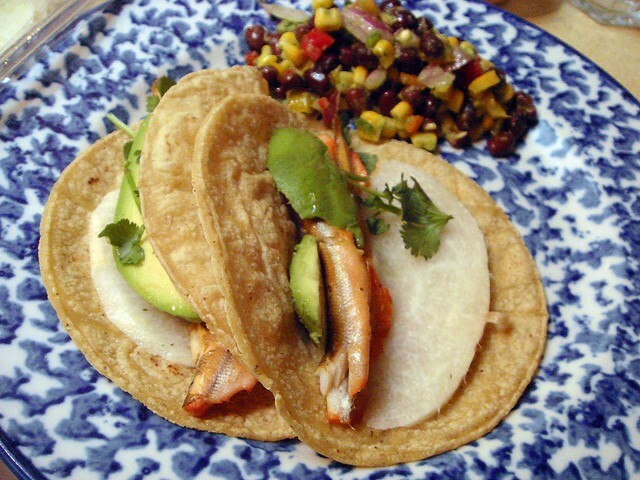 And fish tacos with smelt, marinated jicama slices, avocado, and cilantro. Not pictured was the finished potato salad and the absolutely incredible grilled salmon that my mom made. She spread an herb mustard on top and let it set for a while, then grilled it over charcoal. It was incredible and I should have eaten more of it. Unfortunately, there are no leftovers. But I do have discount Easter candy! Anyway, I plan to post the recipes for the strawberry pretzel dessert and the fresh black bean and corn salad (as if you haven't seen that recipe a hundred times) later this week. Stay tuned. I need to stop reading this when it's this late at night, it makes me too hungry! haha looks great, glad you had a good Easter! You had one MAJORLY delicious easter! I really can't wait for the strawberry pretzel recipe...I've had that mentioned to me a gazillion times but have yet to try it! This all looks so delish!! I want your black bean-corn salad recipe right now, Missy. I just ate lunch and I'm starving again now thanks to you! Jordan, I've fallen into the trap of reading food blogs late at night, but I've learned my lesson. Joanne, I really did! I didn't go back for seconds in time -- stupid snacking while cooking. Cindy, haha I will type it up asap!